The dance of the masculine and feminine is slow and dangerous with ignorance and assumptions in Shariar Mandanipour's tale of a damaged man's ascent to reality. There is seeing, or at least, glimpses of what we think we see — and then there is realizing. Moon Brow is the story of a man coming to know himself and his country. It is slowly revealed that our protagonist, Amir Yamini, was among the last of the playboys of the Persian monarchy. He was a rich, spoiled, adolescent — a naïve young man who defined himself through his sexual conquests and familial rebellions. If that were all we knew of him we might move on. But there is a mystery that compels the reader to stay. What is this "Moon Brow"? Without fully seeing, Amir's adolescent self witnessed the subjugation of intellectual and sexual freedom which would become, to his peers who have realized, too much to bear. 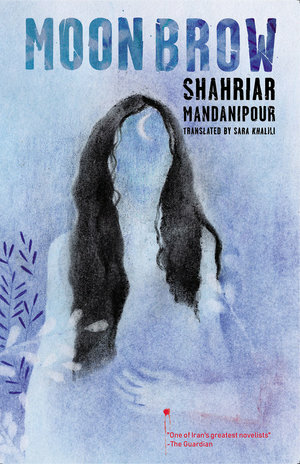 Eventually we will realize that his landlocked, loveless sister embodies author Shahriar Mandanipour's critique of the aftermath of the Iranian Revolution; his frustrated and at times annoying protagonist the embodiment of an aggrieved nation. When we first meet him, however, Amir's mind, shattered like seashells broken underfoot, obsessively pursues as best it can an elusive idea formed from an emotion that is caught in his tangled, post-war brain. The idea rises and flashes in hallucinatory lightwaves at moments, shimmering from the murky darkness like shrapnel caught in a current before it sinks beneath the weight of the rage that formed it. In a centuries-old civilization largely defined by the desert, the Caspian sea serves as a stand-in for Amir's restless mind. The sea is a metaphor for women's bodies, too -- bodies which are cooler than his. This is the only way he knows women, such that he does. The sea holds another kind of knowing, as well, something he senses yet eludes him. His is a damaged brain trapped in a state of perpetual adolescence, his thoughts snarl and tumble in the tumultuous waters of remembered sexual desire, to which, in the terror of wartime, he ascribes a deeper meaning. Mandanipour's prose is graceful and poetic, curving and weaving like the recurring swans, their necks wrapped gracefully around one another in a sensual embrace. In this too, the grotesqueries of what war does to a mind, a body, reveals itself in shards of shrapnel, bone, and a flash of something gold in the swirling sands of the desert. There's a rewarding repetition to this tale, partial memories one catches occasionally like the scent of ripe persimmon whirled about in a breeze that constantly shifts direction. One warms to it -- but the heat increases, uncomfortably. Amid eddies of hot dust and gas, Mandanipour drags us to higher ground, gasping burning air. Amir is a horrified witness to Saddam Hussein's gassing of the Kurdish people in 1988 and my heart pounds as I read this account. Mandanipour served in the Iran-Iraq war and often wrote, with admirable determination, while buried within dusty trenches. This is how Mandanipour's story moves me: the dance of the masculine and feminine is slow and dangerous with ignorance and assumptions, and in the dance there's a haunting search for something elusive amidst the broken seashells, broken swans beaks, broken bodies, broken memories. Moonbrow, however, is not about loss -- it is about what was never fully realized. Restless Books' mission to publish important international works brings the revered Iranian writer's work, translated by Sara Khalili, to an English readership April 2018.